Food is a basic human need and we cannot survive for long without it. While thousands of less fortunate humans are asking for food, thousands of the more fortunate ones are throwing away the excesses on their plates. A caterer who caters food to about 600 employees of a company says that on an average, about 60kgs of plate waste is sent to a piggery every day. When most of us think of hunger, we think of famine the sudden shortages of food due to war or natural disaster. Famine is only the tip of the iceberg; less than 10 percent of hunger deaths are due to famine. The much larger issue is chronic, persistent killer that takes the lives of 24000 people everyday worldwide. It is estimated that about 840 million people live in the condition of chronic, persistent hunger, vast majority of them in South Africa. • Serve on your plate slightly less quantity than what you can eat. If needed go for a second helping. 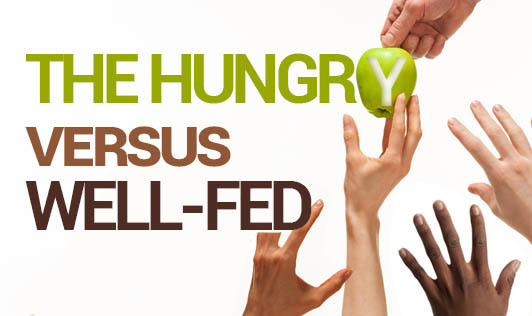 • Arrange for knowledgeable speakers to increase community awareness of hunger and poverty problems, and what people are doing to address them. Consider your self lucky to be able to choose and buy different varieties of food. Next time you want to throw away food, picture a hungry face.